Is eSolar the Next Solar IPO Candidate? Now that solar rooftop panel maker Solyndra has ditched its IPO dreams, are there other solar startup folks that want to brave the public market waters? According to the researchers at Next Up! Research, solar thermal startup eSolar, with an estimated valuation of close to $700 million, could be next. You can read the report over on Sharespost, the experimental marketplace that launched last year for buying and selling private equity. Next Up! Research says that it expects eSolar to show a compound annual growth rate of 45 percent from 2011 to 2015 due to licensing revenues on its solar thermal power technology in the U.S. and China. Because eSolar has largely turned to licensing deals it can achieve margins of as high as 50 percent, and normalized margins of about 30 percent, says Next Up! Though revenues will fluctuate over the years, eSolar could bring in an estimated $185 million a year by 2015. Assuming those revenues and margins, Next Up! says the estimated 2011 enterprise value of eSolar is $682.2 million. Well, first off, because Solyndra had to pull its IPO, there seems to be a subdued amount of interest from Wall St. in solar IPOs right now. Next Up! says that an eSolar IPO could be at least 2-3 years away. By that time eSolar will be much farther along on its deployments and revenue generation. But eSolar seems to be at the front of the pack in the solar thermal market. Its innovation is using pre-fabricated smaller mirrors and components that can ship cheaply and be put together quickly and with little skill. See a video clip with eSolar chairman and former CEO Bill Gross here. One of the problems with Solyndra is that it has unusually high manufacturing and operating costs, and says it makes solar panels close to $4 per watt for solar PV. Last month I wondered if the DOE hadn’t made a mistake when offering Solyndra the first loan guarantee. 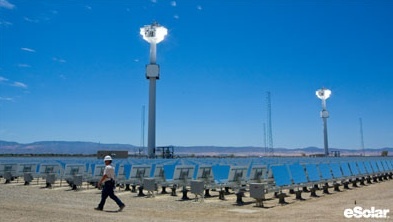 In comparison eSolar, which makes solar thermal technology (not PV), is estimated to be be able to install its solar thermal tech at a cost of $2.75-$3.50 per watt for a plant size greater than 100 MWs. Next Up! says that because eSolar’s margins will be higher than many of its peers, and that’s its enterprise value is on average about $100 million higher. eSolar has signed long-term licensing agreements with NRG Energy, Penglai Electric in China, Acme group in India, and Ferrostaal AG in Europe, Middle East and Africa. eSolar does also has a signed power-purchase agreement with Southern California Edison (SCE) for a 245 MW solar thermal plant. eSolar has gotten $170 million in investment from strategic investors ACME group and NRG Energy, in addition to venture capital and private equity investors Oak Investments, Quercus Trust, Google’s venture capital arm, and of course, Gross’ Idealabs. Envision Solar investor here. EVSI.OB recently had their IPO and should be making some big moves in the near future. They have a revolutionary ideas to produce and utilize solar energy using solar grove is parking lot, near commercial areas…..DUHHH, where energy is need most.